Karen Jensen from Reily Foods, Dan Christenson from PepsiCo and Martin Slayne from SlayneConsulting are presenting on a panel at Q1’s 6th Annual Food Labeling: Evolving Regulatory Compliance Conference. Read below for a preview of topics covered in their panel and insights into the impending National Bioengineered Food Disclosure Standard Law updates. Karen Jensen: As Senior Regulatory Manager for Reily Foods, I manage compliance for labeling across our portfolio, which ranges from coffee to mayonnaise to hot sauce. I participate in groups such as GMA and the National Coffee Association, providing inputs as well as bringing back insights to the company. In addition, I scan the horizon for emerging regulatory concerns, proactively informing our Innovation team so that we can best manage concerns like acrylamide, for example. Dan Christenson: I am senior director of U.S. Federal Affairs in PepsiCo’s Public Policy and Government Affairs function. This role encompasses leading issue advocacy, cultivating relationships and engaging with both the U.S. Congress and the Executive Branch. In this capacity I work closely with many advocacy organizations such as the Grocery Manufacturers Association (GMA), American Beverage Association (ABA), and SNAC International (the snack foods association) on issues of importance to the food and beverage industry. Martin Slayne: I am the President at Slayne Consulting LLC, supporting organizations on food and consumer products, regulatory strategy, risk analysis, health and wellbeing, science and advocacy, and covering US & International. Previously, I held global head and leadership roles on scientific and regulatory affairs, food safety and nutrition at The Hershey Company, Mondelez International and PepsiCo. The highly active US regulatory landscape has focused recent work on US labeling and claims, implications in International markets for regulatory strategy and compliance, together with US impact on building consumer trust. With a December 1 deadline looming, what will change if the USDA’s criteria for the National Bioengineered Food Disclosure Law favors consumers? What will change if the ruling favors manufacturers? KJ: Actually, I see this as being more multifactorial than just manufacturers vs. consumers. Ingredient manufacturers don’t want to be forced to include a GMO label if their wheat is transported in the same containers as corn, so they’re focused on determining a fair number for the threshold of BE ingredients. Food manufacturers want to satisfy consumer’s desire for transparency without taking on inordinate burdens of testing or tracking that would ultimately raise prices for consumers. Consumers don’t have a homogenous point of view on bioengineered products either. Millennials tend to be more concerned than Baby Boomers. Perhaps the most defining element of the new rule will be whether refined ingredients like soybean oil and sugar are going to be labeled as bioengineered. If not, consumers may feel that the ruling has not met their needs for transparency. In that situation, most manufacturers would likely choose to voluntarily disclose because of their commitment to meeting consumer needs. This could lead to inconsistencies and confusion across the industry. DC: It is still too early to say where USDA may land on some of the key issues. PepsiCo continues to be a supporter of a transparent labeling system that provides consumers with access to the information they need in order to make good choices about the products they purchase. We will continue to support that type of system and do all that we reasonably can to advance sensible transparency policy. MS: The desired outcome from the criteria is a clear understanding of when to label and when not to label as BE. It will be a good thing to have consistent criteria. A key factor will be defining what low-level presence is acceptable without having to label. There are perhaps two main camps on this: one stricter, more in line with global precedents such as in the EU and with consumer representations, wanting the origin of the ingredient crop to be the basis for labeling; and the other allowing greater flexibility where the processed ingredient is not different regardless of whether the ingredient is from BE or non-BE crop origin. The second would avoid labeling in more cases and less ingredients would be considered to be BE. The implications for compliance, both in the US and for international trade, will depend on the details of the criteria. This will need close examination, for consistent interpretation and clarity on expectations. How will the new criteria fit in with the FDA’s update to the Nutrition Facts panel? KJ: Ideally, they would have been rolled out together, but the deadline for the Facts Panel is Jan 1, 2020, for large manufacturers and the deadline for Bioengineering disclosure remains to be determined. A recent IFIC (International Food Information Council) study indicated that 36% of Americans know “very little or nothing at all” about bioengineered foods. Consumer education on Bioengineering should be a priority that is built into the ruling. DC: For many food manufacturers with thousands of SKUs, the impact of the updated FDA Nutrition Facts rule is significant. While manufacturers are in the process of making necessary changes to be in compliance with the new requirements, the largest challenge is the harmonization and sequencing the changes to both USDA’s rule and FDA’s rule, so that the need to undergo this process twice is minimized. MS: The requirements for BE will be an add-on for further packaging change. Nutrition Facts panel changes are well underway already. What is one thing that excites you about the future of the food and beverage labeling industry? KJ: Much like my favorite restaurant that lists the exact farm where their chicken and other ingredients are sourced, food labels are moving toward this same level of transparency via digital platforms. Food companies are providing this information not because of a regulation, but because of a desire by consumers to understand the food they purchase for themselves and their family. DC: The opportunities we have to work collaboratively with government and NGOs on key pillars within FDA’s Nutrition Innovation Strategy is very exciting. 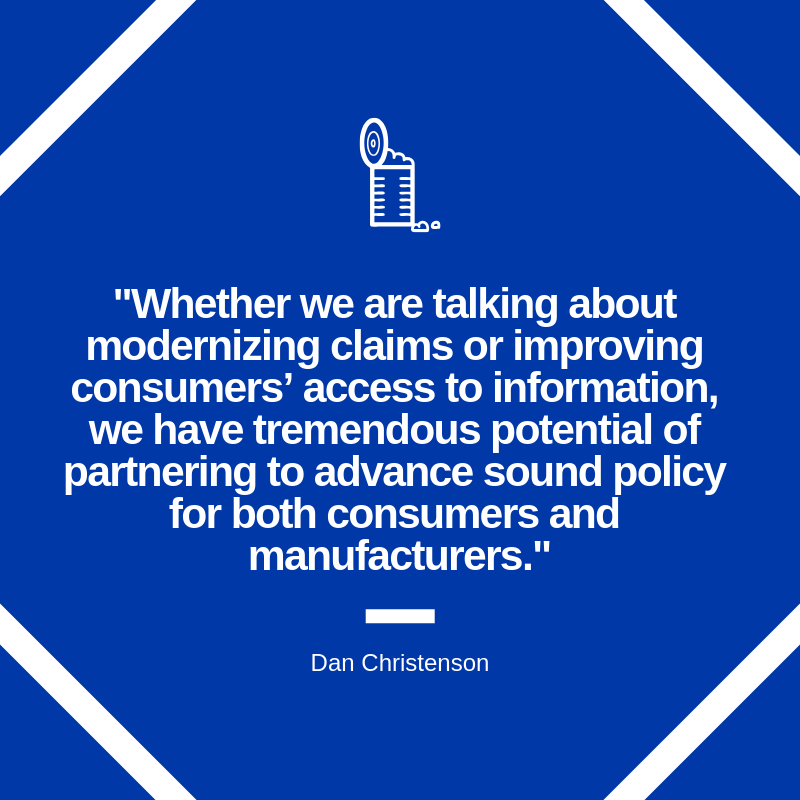 Whether we are talking about modernizing claims or improving consumers’ access to information, we have tremendous potential of partnering to advance sound policy for both consumers and manufacturers. MS: More transparency, visibility of consumer expectations, the balance of technology becoming accepted vs. legitimate reservations and scope for greater sharing on perception issues, as well as the scope for greater global harmonization are all areas that excite me. To learn more about predictions, implementation and problem solving for the BE Disclosure Law and Nutrition Fact label changes, reserve your spot at a food labeling our dietary supplement event.